These roses were cut this morning before pruning the bushes for fall. Fall here is rally short, only about two weeks in December or January when the leaves finally fall off the trees. I thought we were going to have an early winter this year, but it seems to have gotten a bit warmer today. Also I noticed there are still a lot of green leaves on some of the pear trees. The past few years we have been raking leaves in January, so maybe this year will be the same. Blogging is challenging for me right now. I am, let me say, redefining my life goals. I figured out that I wasn’t so much procrastinating, as not having a clear direction on how to proceed on my life’s journey. At 53 it seems a little late to rethink my life’s goals, but like most things, better late than never. I am still exercising daily, which now includes special exercise for my back and neck. Knitting, crocheting, and sewing can have a deteriorating effect on the back, since we look down at our work and often shorten our necks to look up without straightening our spines. Well, at least I know I have done so in the past. I recently took a class offered by my health center that showed me how to lengthen the vertebrae in my neck and lower back while contracting the vertebrae between my shoulder blades. It is my understanding that I should keep my spine straight and bend at the hips to look down. Yes, it is as uncomfortable as it sounds especially at the sewing machine. At the same time, it is important for me to practice keeping my spine in line so any curvature I have now doesn’t get worse. I read somewhere (that I cannot remember right now) that it takes 7 months for changes, good or bad, made today to start to show at the cellular level. I have been exercising daily now for about that long and am just beginning to see a marked increase in my mobility. So in 7 months I will let you all know if my neck and back are more in line. Here is a photo I took the other morning when I had planned a blog post I didn’t get around to writing. I bought the tulips at the store. 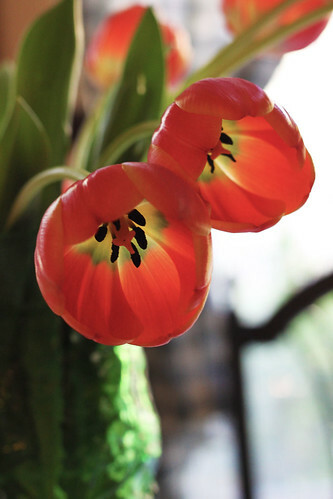 Even though they were droopy, I thought they looked so pretty on the breakfast table. On a side note, Rick is now the owner of the domain drawnshadows .com. We bought the hosting and were able use the website he already had made using iweb on the mac. The movies do not always load, so we still have to figure that out. Rick is starting to show his paintings and won “Best of Show” at his first competition. He was advised to get a website. I thought it was going to be much more expensive than it turned out to be, mainly because he had the website already made. I also bought the domain yarnjourney.com for only a dollar a month. I am still deciding what to do. I can use iweb to create a site and use the same hosting we used to set up Rick’s site. Now I just have to see if there is a place in my life goals to have a website. This entry was posted on Tuesday, November 30th, 2010 at 7:37 pm and is filed under Life. Tagged: Life. You can feed this entry. You can leave a response, or trackback from your own site. How nice to see you posting and with more of your gorgeous roses! 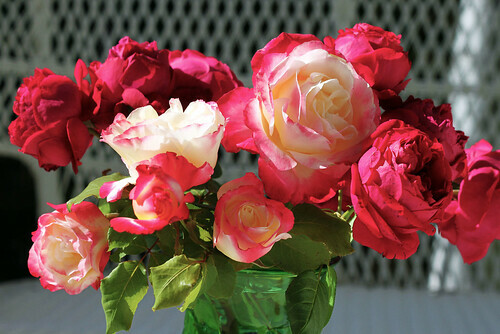 We are shivery cold here in Wisconsin and roses are a distant memory…seeing yours restores my spirits! At 53, you are still so young! I find at 66 I am still figuring out where to go and the journey gets more interesting along the way! Continue to take care of yourself – sounds like you are on the right track.